One of my favorite things on this earth is my Grandma’s Strawberry Freezer Jam. Mmm! I hate when I am running low on it! I lived in California until age 9 and even after we moved, we still went back every summer for a couple weeks. My grandma lived about 20 minutes from our house, so my mom, sister, and I would drive over during the day more often than not. My grandma always had the best jam and toast as a snack when we came to visit. If you haven’t made homemade jam yet, you should try it out. It is pretty easy and tastes so much better than store bought! This is my grandma’s homemade freezer jam recipe (which is the same as the MCP pectin recipe) and it is DELICIOUS! Use firm ripe fruit. You don’t want to use under-ripe or over-ripe. It will effect the set of your jam. Only use the recipe that your pectin calls for. Mix and matching different pectins and recipes will cause your jam to fail. This is the recipe for MCP brand pectin and it is my favorite. Wash, stem, crush and finely grind strawberries. Combine exactly measured strawberries and lemon juice into a large bowl. Gradually stir in 1 box of MCP Pectin to berry mixture. Set aside for 30 minutes, stirring every 5 minutes to dissolve pectin completely. Add sugar gradually. Stir well to dissolve completely until its no longer grainy. After sugar is thoroughly dissolved, pour jam into containers, leaving a 1/2 inch space between jam and top to leave room for expansion and cover. Leave out at room temperature for 24 hours until set. Store in refrigerator up to 3 weeks or store in freezer for up to 1 year. This jam would go perfectly with this Whole Wheat Bread! 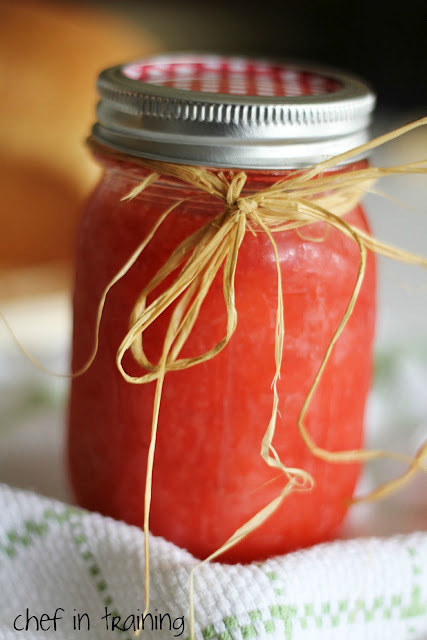 I love a nice quick jam and this is very similar to mine, but I never added the pectin. I'll have to try this. Great recipe!! This looks great! Do you mind if I pin it? You combine the strawberries, lemon juice and MCP pectin thoroughly until dissolved. Sorry I didn't clarify that but I fixed it now. Thanks for bringing it to my attention. Yeah, when do you cook it?? I never do. The recipe just said you could on a very very low heat, but I removed it because heating it wrong could change the structure of the sugar, so I removed it and just do it all at room temperature, no cooking involved. Store in Freezer? How long is it good after defrost in refrigerator? Ok! I'm being dense I'm sure. What is MCP pectin? THANK YOU!!! I am pretty excited to try this this year. What quantity is in a packet of MCP pectin? We don't have that brand here. Thanks for the recipe, can't wait to make it! I grew up on this jam and to this day is the ONLY jam my family likes. Much to my horror we are currently out (we never seems to make enough for the full year), so I actually had to buy jam last week. I cannot wait till June when stawberries are in season in Iowa so I can make again! Yeah...I'm clueless on MCP pectin as well. Is that just a brand name? Good in refrigerator for up to 3 weeks.Good in freezer for up to 1 year. It is the brand of pectin that is my favorite. Each pectin has its own recipe, so whatever pectin you end up using, make sure you follow that specific recipe or your jam will not turn out. My personal favorite is the MCP brand. It is super easy and tastes amazing! When you say "seal" and freeze...do you mean actual canning procedure seal or is a tight lid on a ball jar ok?? Gees, some people cant read! Half the questions being asked are clearly stated in the very simple recipe! How long do I cook it...the recipe is called NO-COOK Strawberry Freezer Jam! It is a 2 oz box. But make sure you use the recipe that comes with the pectin you end up getting or it will not set properly. The MCP brand is just my favorite. Sorry about the confusion. I have hopefully edited the recipe in a way that can answer all these questions. It is just a tight lid. Do you have to use glass jars or could you used freezer boxes/containers? You must be reading my mind...ha ! i am planning on making some strawberry jam this year...have the strawberries i am growing in the garden..i may venture out to this recipe instead,but what isle is the pectin in at the grocery..where would i find it..that's my only question? How many standard Mason jars does this recipe fill? i love freezer jam, i make it every summer! Is there any sweetners that can be used instead of the corn syrup? Where do you find the pectin in the grocery store? hahaha i know!! read the name of the recipe people!! The photo for freezer jam is in a glass jar. I am assuming you are not freezing in glass, right? I usually can my strawberry lemon marmalade in boiling water. I live in Nebraska and I am having trouble finding the MCP pectin. Was wondering what store you buy this at? This sounds so great. Do I have to use corn syrup? Any substitute that I can use for it? Have you ever used this recipe with a different kind of fruit? I have a bunch of peaches and was wondering if it would still work..
Do you have a preference of fresh lemon juice or in a bottle? I noticed your other peach and strawberry jam recipe. Can you cut the quantity of strawberries from this recipe in half and substitute with peaches? My mother made freezer jam many, many years ago and I've been making it for 40 years! There is no other jam that compares to the taste of freezer jam because it tastes just like fresh fruit! And another great thing is how easy it is! Strawberry is my favorite, but I've also made apricot and plum...which are also really delicious. I know this is an old post, but I want to try this. Can any jar and lid work? Do you think I could even use my old pasta sauce jars and lids? thank you! MCP has changed the recipe!! I couldn't find the old one anywhere and am so happy to find it here! Thank you for posting this recipe. In this years box of MCP 2015. I don't understand why the Freezer Strawberry Jam recipe does not call for Karo Syrup. I have always used Karo Syrup in it, how could it be needed one year and not the next??? I'm so confused, does anyone know why? I was wondering the exact same thing. I can't find anything on the web about it. My mother always taught me to compare the directions from year to year. I'm glad I saved an old copy of them! Same question: I'm new to jams and and have been reading all over the web. It seems like MCP is the best for freezer jam and everyone says use corn syrup. They also say do it exactly as the box recipe specifies. Now the box says skip the corn syrup. However, most of the posts are pre-2015. Is it possible that they have changed the pectin powder composition, so that the corn syrup is unnecessary? Does anyone have experience with this new recipe? Why does the recipe on the box of MCP pectin no longer use corn syrup? Will it still work the same? also I used to warmed it on stove on a very --very low heat to just room warm before pouring into jars-- that direction was changed long ago--? but wondering why no corn syrup--- prevents crystallizing --? ?